The last part of the news you expect to be racy is the financial report. 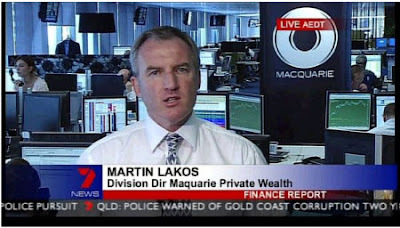 Australian television has proven to be an exception to the rule when Chris Bath of Australian Channel 7 interviewed Martin Lakos of Macquarie Private Wealth. While the very serious interview was going on, a colleague of Lakos could be seen clearly looking at seminude photos of supermodel Miranda Kerr. Only late into the short interview segment did the banker find out that his web surfing was being beamed live into homes all across Australia. Macquarie Private Wealth as well as Seven News are embarassed at the inadvertent broadcast of a stimulus package during a piece on private investment. The short news segment has become a mega hit on You Tube, getting millions of hits. Undoubtedly, Miranda Kerr's stock has gone up in the aftermath of the embarrassing media gaffe, in a case of riding on Macquarie Private Wealth 's shirt tails. Macquarie Private Wealth issued the following statement concerning the embarrassing incident. "Macquarie has strict policies in place surrounding the use of technology and the issue arising from the live cross on Seven News is being dealt with internally." I would imagine that reading a suspect his Miranda rightstook on entirely different meaning at Macquarie Private Wealth after the nameless investment banker was caught looking at a portfolio that did not belong to any of his existing clients. Bloopers on television news are not new. Type in "News bloopers" on You Tube and you can find a multitude of truly embarrassing moments. One of the cleaner ones involved a live broadcast that could not be scripted. Many involve truly embarrassing slips of the tongue or flashes of tension between news anchors who really don't get along. I feel sorry for the anonymous banker who got caught checking out Miranda Kerr's ummm "assets". The red faced bosses at Macquarie Private Wealth can take consolation in the fact that they will have an increase in name recognition of their company in the future among people who never would have otherwise given them a thought. Publicity like that is hard to find now isn't it?